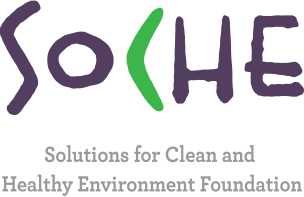 SoCHE stands for Solutions for Clean and Healthy Environment. It is a not-for-profit social enterprise aimed at environment conservation, social upliftment and Corporate Social Responsibility (CSR) advisory. It has been founded by professionals who have over a decade of experience and expertise in sustainable development, climate change and CSR. As an environment conservationist and CSR professional, Kanika travelled often to different parts of the country for projects related to sustainable development. Wherever she went, she realized that the traditional knowledge of living sustainably, co-existing and respecting nature, flavours of local handicrafts and biodiversity are dying very fast due to rapid urbanization. Inequity is forcing people in the villages of India to move to the cities to earn their livelihood. Specifically in the case of traditional handicrafts, middlemen are making most profits; while the production process remains inefficient and polluting. In 2013 Kanika herself started to learn pottery and realized the urgent need to help artisans in this country survive with respect. The more she learnt the craft; she realized the missing connection between artisans and sustainable development. That led to the inception of SoCHE, as an endeavor to connect the unconnected masses through social equity and environment conservation. Enable greenhouse gas savings to the tune of 0.5 million tonnes (of CO2e) Through our work, we want to build on projects and success stories that contribute in achieving this. SoCHE in hindi also means thought. We believe that change begins with a thought, which then needs to be backed with meaningful actions. Our name can therefore be read as both in English and in Hindi… Soche ke toh dekho! The green boomerang is an integral part of SoCHE Foundation’s logo. It represents the inter-connectedness between Earth and its inhabitants. A boomerang always comes back to the person who throws it. Similarly the Earth also reciprocates to the way we treat her with same intensity. At every step, therefore, we need to ensure that we co-exist in harmony with Nature, preserving it through our thinking and actions.